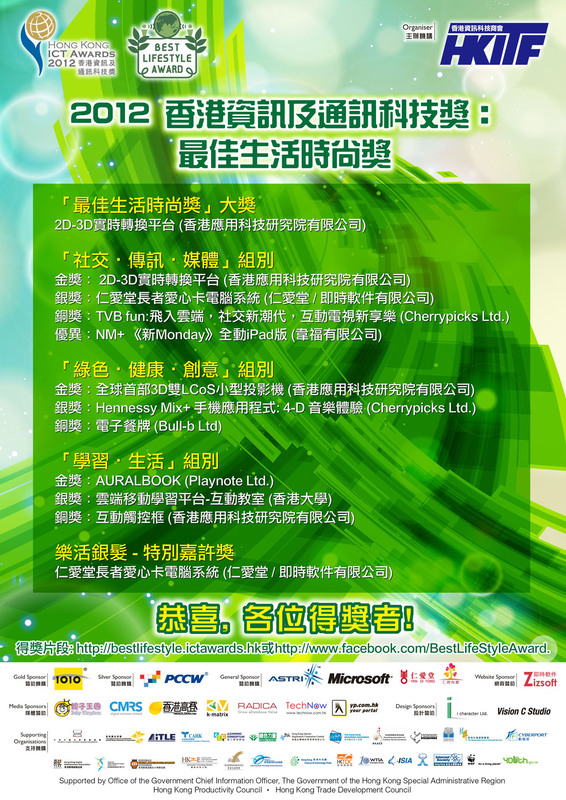 (3 April, 2012 Hong Kong) Supported by the Office of Government Chief Information Officer (OGCIO), Hong Kong Productivity Council, Hong Kong Trade Development Council and organized by Hong Kong Information Technology Federation (HKITF), the Hong Kong ICT Awards (HKICTA) 2012: Best Lifestyle Award, celebrates its successful closing on today’s presentation ceremony at Theatre 1, Hong Kong Convention and Exhibition Centre (HKCEC), Wanchai, with a loud and enthusiastic applause. The Award is honored to invite industry practitioners and senior professionals to officiate the ceremony. ◆ “Best Lifestyle Grand Award” & “Best Lifestyle (Social, Communications & Media) Gold Award”: “Real-time 2D-3D Conversion Platform” by Hong Kong Applied Science and Technology Research Institute Co. Ltd.
◆ “Best Lifestyle (Learning & Living) Gold Award” : “AURALBOOK” by Playnote Ltd.
◆ “Best Lifestyle (Social, Communications & Media) Special Mention (Silver Market)”: “Yan Oi Tong Love Elderly Card System” by Yan Oi Tong / Zizsoft Ltd.
To splendid this event, the organizer is honored to invite industry practitioners and representatives including, Dr. William YU, Head of Climate Program of WWF Hong Kong, Dr. Royce YUEN, Visiting Associate Professor of Faculty of Business & Economics, the University of Hong Kong, Ms. Irene LEUNG, Chairperson of Organizing Committee of Best Lifestyle Award, Mr. Francis FONG, President of Hong Kong Information Technology Federation, to present trophies for the winners. Since the establishment in 2006, the Hong Kong ICT Awards promote and commend the excellent achievements to which Hong Kong ICT professionals, business corporations and organizations contribute. 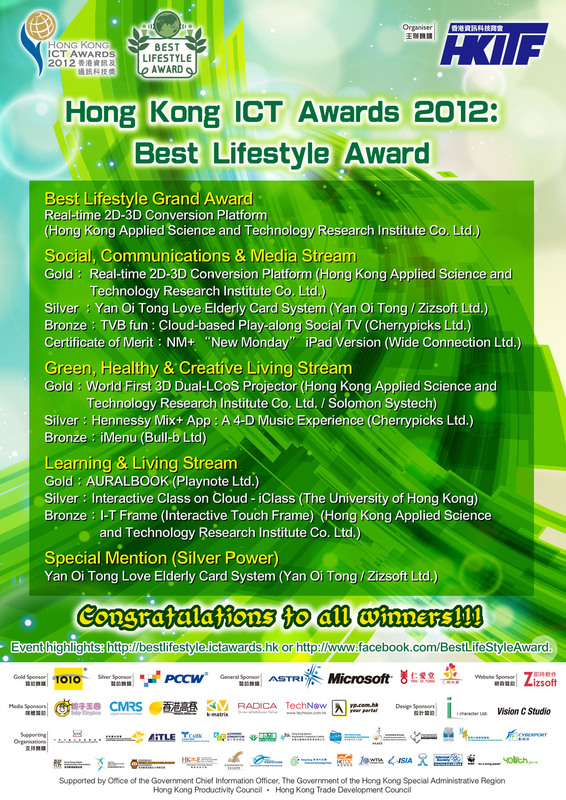 The Awards comprise ten categories; Best Lifestyle Award is one of them and offers three awards streams, namely: “Green, Healthy & Creative Living”, “Learning & Living” and “Social, Communication & Media”. 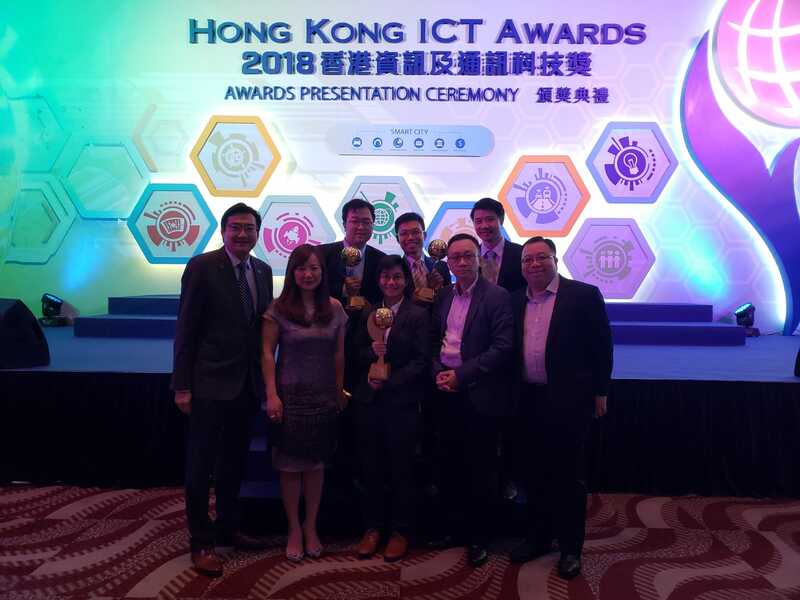 To respectively commend the achievement of preeminent ICT applications, website and service among each group, Best Lifestyle Award aims at promotion of local ICT development and encouragement of more innovative solution by industry staff. The Hong Kong Information Technology Federation and the Hong Kong Internet Service Providers Association jointly holds a Press Conference to announce their support towards helping school children “Go Online!”. [16th November 2010, Hong Kong] The Hong Kong Information Technology Federation (HKITF) and the Hong Kong Internet Service Providers Association (HKISPA) held a press conference today with various guests to announce the start of the “Go Online!” campaign. With help from the HKITF and the HKISPA, this campaign helps school children from families receiving aid under Subsidy Scheme for Internet Access Charges (SIA) for the 2010/11 school year to encourage them to make the most out of the internet at home for school work.